The colors are starting to really show in the High Country. 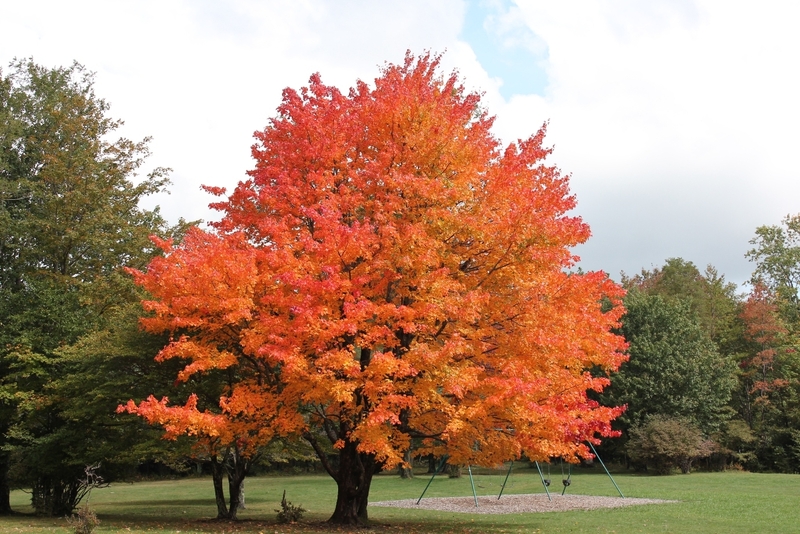 This photo of a sugar maple in Grayson County was taken on September 25, 2011. This weekend and next weekend (October 1-2 and 8-9) will probably be the peak times to view fall foliage in the Southern Appalachians at elevations above 4000′, with mid-October being the peak viewing times for lower elevations in Southwest Virginia. This past Sunday afternoon my sons Isaac, Karl and I went for a five mile loop hike on the Iron Mountain Trail / Forest Road 84 off of State Route 600 in Smyth County. These photos were taken at the Skulls Gap scenic parking lot, which is about 3500′. The colors are starting to change at higher elevations and all foliage is taking on that golden hue in the evening that signals autumn has arrived. Click on any of the photos to enlarge to appreciate the panoramic views. View from Skulls Gap of the Valley. 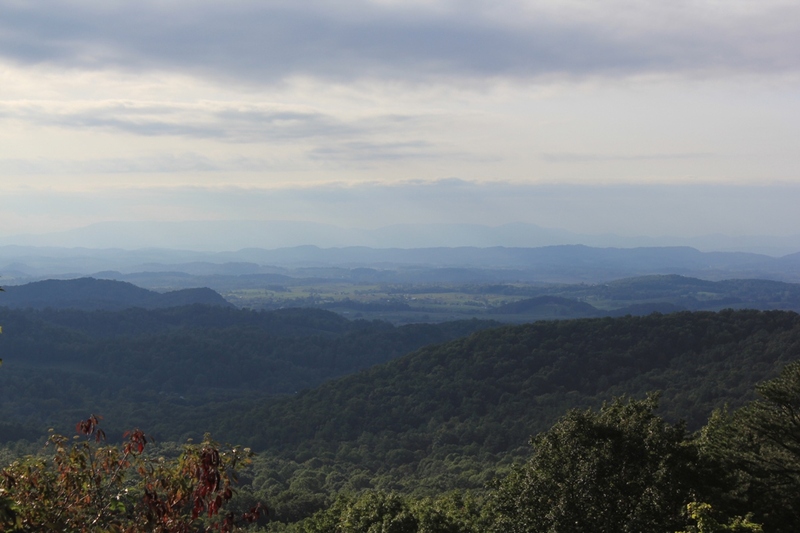 Clinch Mountain is barely visible on the horizon. Clinch MountainIron MountainsPhotographySmyth CountyWashington County Va.
On the evening of September 21, 2011, a series of beautiful rainbows appeared over the mountains. 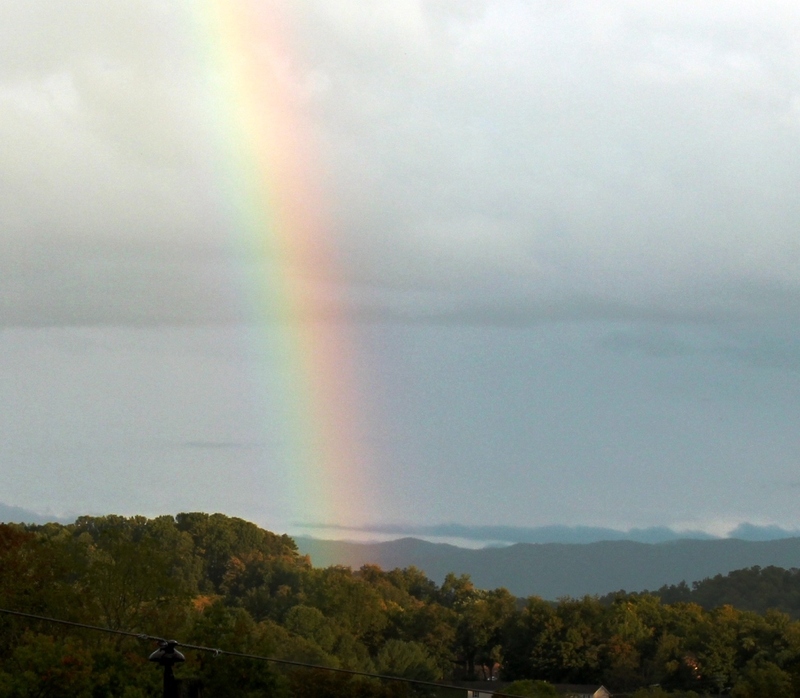 From Abingdon, they appeared to rise from behind Holston Mountain and Whitetop Mountain. I took some quick photos of them. 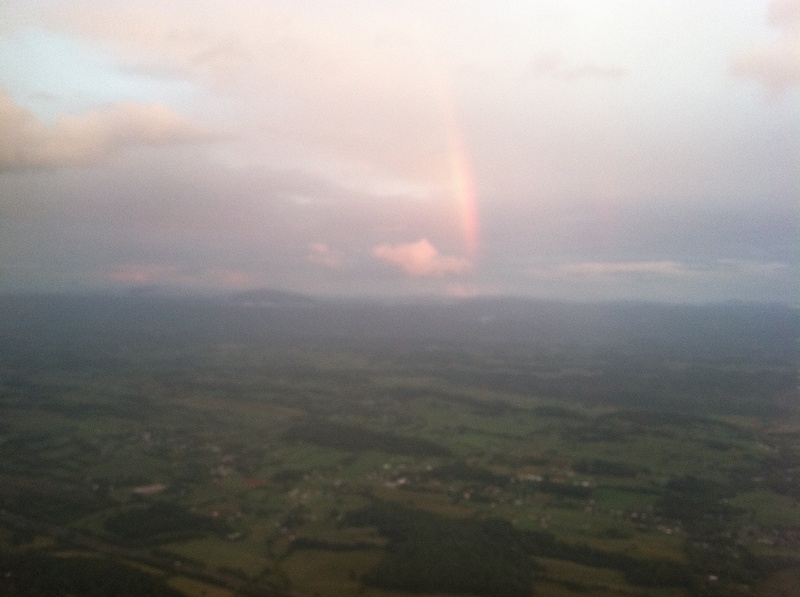 Somewhere 15,000′ or more above sea level in the sky, my friend took a photo of the same rainbows. I thought it was unique to have these two different perspectives, thus this post. Compare the photo on the right with the photos below. 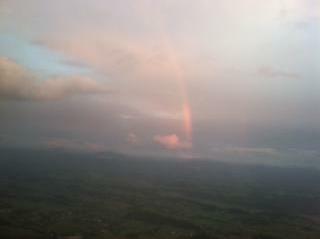 It’s amazing that no matter where you were, the rainbows appeared to rise to the heavens. 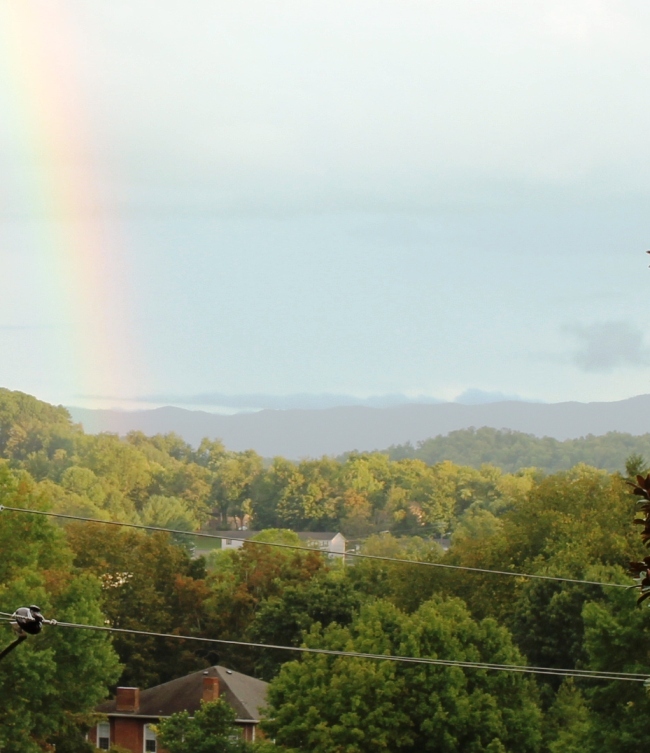 Rainbow over Holston Mountain. Note the fog in the valley near Tennessee. It is 3:30 AM. We are parked on a rural hilltop next to a gas station that closed for the night five hours ago. The gas station is several miles outside the little town of Bakersville, North Carolina. We’re less than 10 miles from the Tennessee state line. Dozens of other passenger vans are lined up on the hill next to us, here, in a place that can only be described as the middle of nowhere. Wincing, I slowly extend my right leg in order to begin to exit the cramped van. My teammates and I have just traveled 100+ miles over winding, mostly secondary mountain roads in North Carolina since leaving Grayson Highlands State Park in Virginia at 10:30 AM yesterday morning. At least one of us has run every single mile of this journey. And we’re only a little over half way to our destination. After 15 miles of hard running yesterday and no sleep this night, my legs are sore and my eyes are bleary. This is the third time I’m doing this running drill. I don my headlamp and a reflective vest with blinky lights in that cool, slightly foggy air so typical of the wee morning hours in Southern Appalachia. I gingerly walk over to the “exchange zone,” an area consisting of orange cones with race officials carrying clip boards and stop watches. I inform them of my race number, 314, and the race number of our team captain, Jasen, who is currently on the course and who will shortly hand off to me the large, blue wristband stamped “BLUE RIDGE RELAY” that we are carrying by foot to Asheville. Many of our competitors are wandering around the same area, several like me trying to loosen up their knotted muscles before the exchange. Some of my own teammates are awake, too, perhaps ingesting a nutrition bar or banana or drinking water to get much needed calories or fluids. (“Ingesting” is a better description than eating, for there is little pleasure in forcing the food down at this hour after the latest gut-wrenching ride). Others on the team are in the van trying to get at least a few moments of uncomfortable shut-eye before their next run. Those of us who are awake peer into the blackness where the road disappears. We are waiting. After a while, a few headlamps and blinky lights begin to appear at the base of the hill. Human shapes emerge slowly as we begin to recognize the runners who approach. So motivated, I run off into the darkness, continuing the race. Within a few minutes, I am once again all alone. It’s just me and another long stretch of asphalt, though I can only clearly see about thirty feet ahead by the illumination of my headlamp. Although running alone, I’m not lonely. That’s near impossible when your legs are windmilling downhill and your heart rate is pushing past your aerobic threshold. 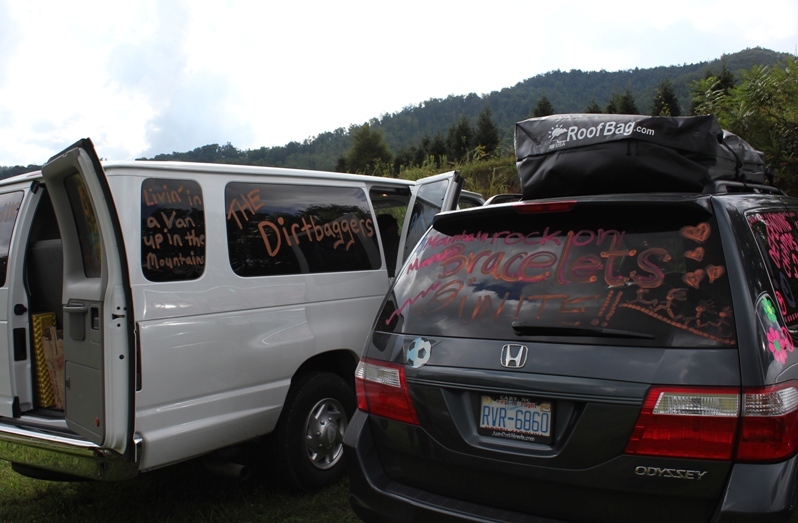 The Dirtbaggers’ passenger van whizzes by, leapfrogging me to the next exchange zone. My teammates in the van hoot and holler and shout encouragement as they roll past. I acknowledge them with a raised right arm. Geez, I can’t let these guys down by cracking on this leg of the race. My first, foremost thought at this ungodly hour is that I must get to the next exchange zone as quickly as possible and hand the wristband to Aaron, who will carry it through Bakersville and another stretch of darkness until the next teammates—Keith, Sean, Scott, Mike, Cam, Bruce, Jim and Byrum—do the same thing as we travel the remaining miles of our meandering route (and then three of us will run yet a fourth time to reach the finish line in Asheville). Then there’s no further deliberative thought. There is only movement. Movement, and the will to keep pushing through this run. Welcome to the Sixth Annual Blue Ridge Relay. Race to beyond the horizon: View from the Little Pinnacle at Grayson Highlands State Park the morning of the Blue Ridge Relay, September 9, 2011. BRR has 27,000 vertical feet of climbing. That’s like climbing Mount Everest more than twice (remember Everest climbers start at 17,000 feet). No, it’s not a truly analogous comparison, but it gives you an idea of the vertical climbing in this monster race. The start of the 10:30 AM wave. There were waves of runners from 6:00 AM through 1:30 PM. 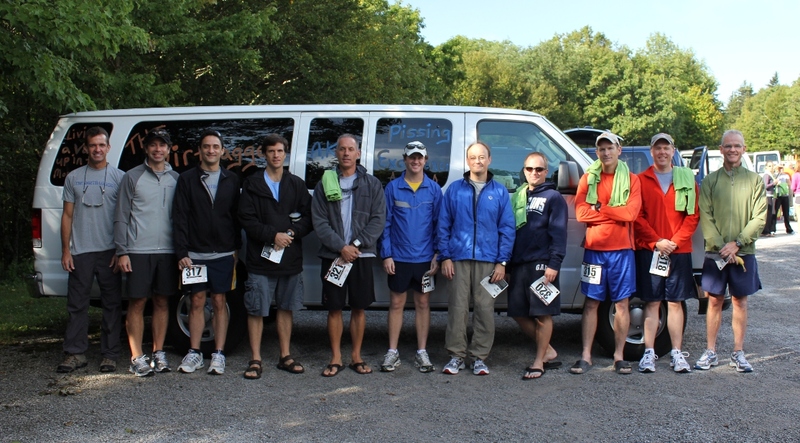 On September 9th and 10th, 2011, our team, named “The Dirtbaggers,” ran the 208 miles in just under 27 hours at a 7:47 minute per mile average pace. We came in 20th place out of the 120 teams that started the race (several teams DNF’d). Amazingly, the winning team, the Asheville Running Collective, ran 208 miles in a little over 20 hours with a scorching 5:53 minute per mile average pace. 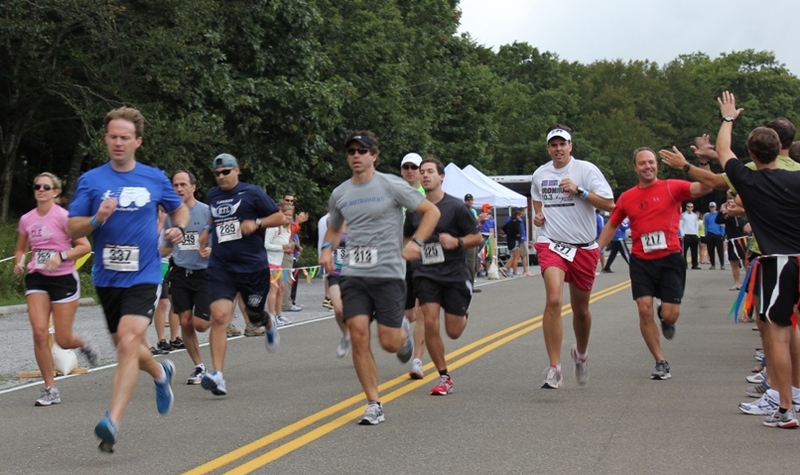 The BRR is one of the oldest road relay races in the Eastern United States. The concept of super long relay races goes back a couple decades or so, with several of the first ones out West, most notably the Hood to Coast 200 mile relay race in Oregon. They have picked up much greater interest in the last decade on the heels of the big running boom the United States is currently experiencing (marathon running is up 37% percent since 2000; this year was the first year that even those runners who qualified for the Boston Marathon had to be chosen by a lottery in order to get a place on the starting line). While most runners still consider ultra-running and other mega running events like the Blue Ridge Relay as extreme, these kinds of races are enjoying a concomitant growth and increased interest for those looking for the next challenge after the marathon. The relay has 36 sections, each of which is between 3 and 11 miles in length. Starting at Grayson Highlands State Park at over 5000’ elevation in Virginia, the race includes some of the most scenic and highest mountains in North Carolina, including a climb up the ramparts of iconic Grandfather Mountain (5900’) and around Mount Mitchell (6600’), the highest mountain in the East. Several legs are on or adjacent to the Blue Ridge Parkway. Generally, the race bounces between 1500’ and 4000’ vertical feet practically every three or four legs. The map of the entire course shows it generally travels south. The race officials generated topographical maps (which do not do the course justice and don’t show all of the hills) for each of the 36 legs. I ran legs 2, 13, 24, and the brutal, penultimate 35 (containing a 7-11% gradient climb up to the Blue Ridge Parkway). Each leg is rated easy, moderate, hard, very hard, or “mountain goat hard.” As we ran this race, we realized, however, that easy, moderate, and hard are relative terms. Even the so-called easy runs usually had hills that, in their own right, would be called hard by anyone other than the organizer of a 208-mile race in the mountains. 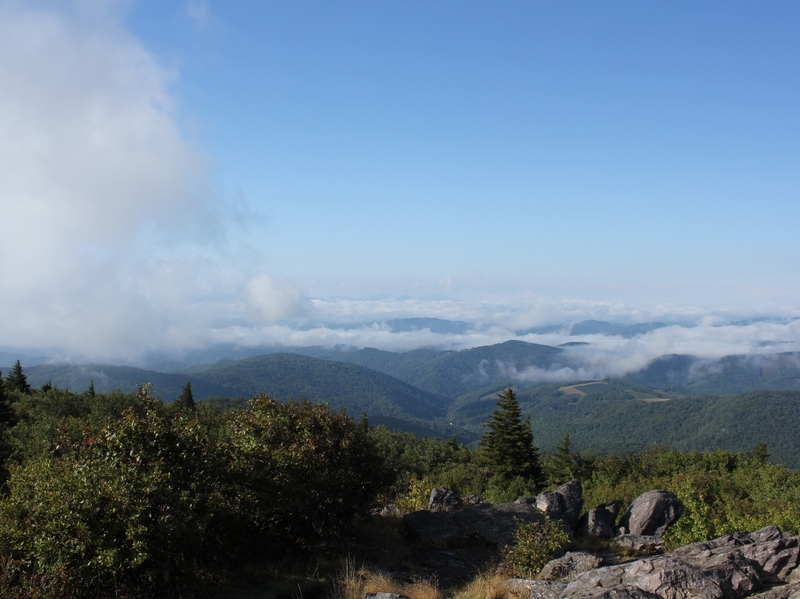 The longest leg was 10 mile all-uphill run on Route 220 that essentially paralleled the Blue Ridge Parkway as it climbed the bottom half of Grandfather Mountain. There were two mountain goat legs, each of which had climbs that exceeded 13% gradient in places. There were also long, unrelenting downhill runs that would punish the hamstrings and knees. One all-downhill run was nine miles in length! I love individual races; they provide their own reward. There’s no hiding in an individual race. You wholly own the result, for better or worse. The Blue Ridge Relay was not necessarily a “better” race than a solo race, but it was definitely different. The beauty of the relay race concept is that while only one member of the team is racing against the clock at a time, there is a collective team effort that in some ways elevates the event beyond an event of comparable or greater individual effort such as a solo marathon. At the same time, because the BRR is a mountainous course, no leg is exactly like any other leg in length or topography, and direct comparisons between the runners is difficult. Each team member just has to run the best they can on their unique segments of the course. Not just a fashion statement: Reflective vests were mandatory on Blue Ridge Parkway. 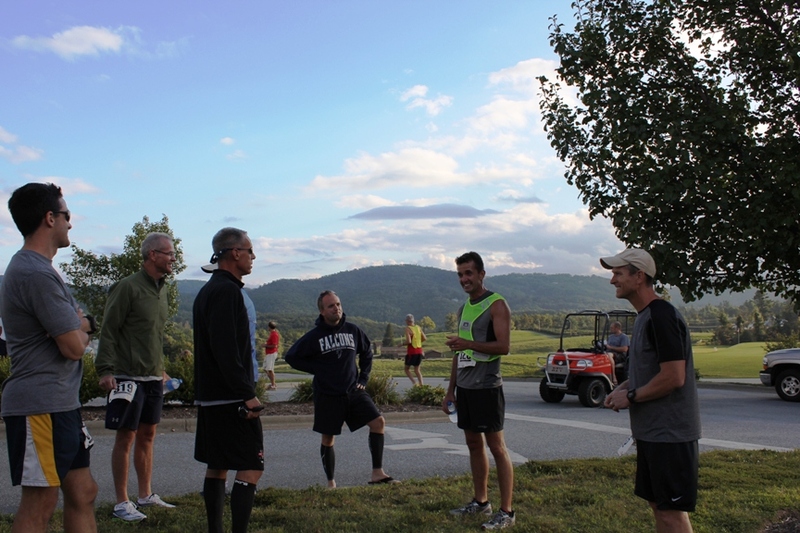 Byrum describes leg 11, a Parkway run, to teamates Sean, Mike, Bruce, Cam and Aaron. Mountains near Boone frame the background. Running for a team puts a different sort of pressure on you; for me, this different motivation was refreshing. The camaraderie and fellowship of doing the relay together with my teammates was more “fun” than a purely individual race. Obviously, how much “fun” a race like this is depends on who your teammates are—you need to think about with whom you want to spend a sleep-deprived night in a van in the mountains when you put together your crew. Although every single one us had not been on a team with every other one of us before this race, most of us had a connection to several others on the team. We were fortunate, too, in that the guys on the team were cool, got along, and jelled well. 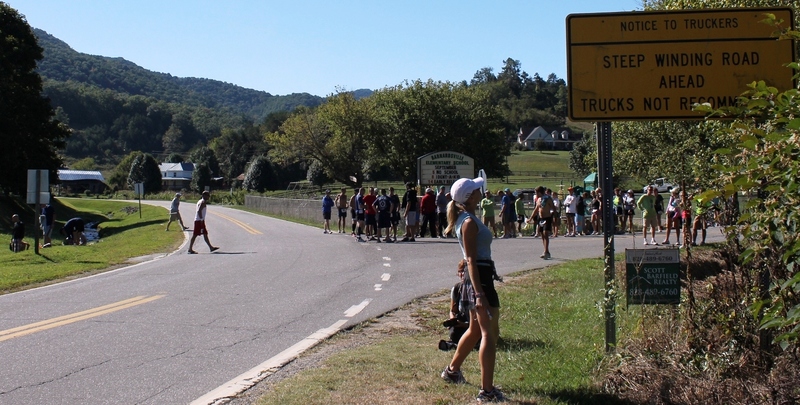 The Blue Ridge Relay is as much about the non-running aspects as the runs themselves. The whole thing was a great experience that is very different than an ordinary race. 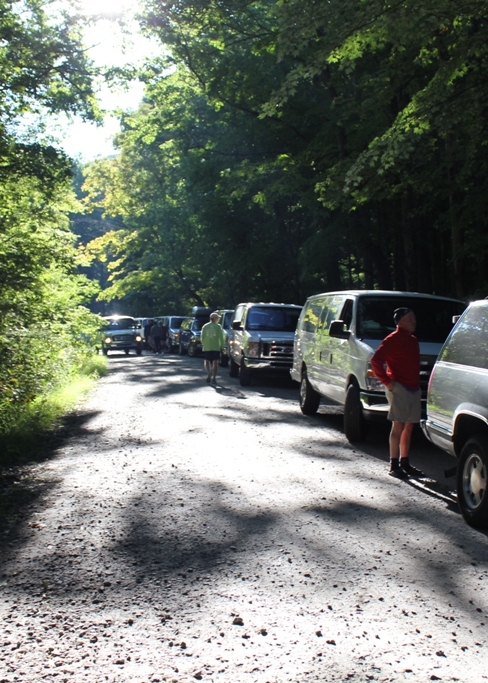 On top of this, not knowing exactly what to expect (none of us had done the BRR before) and the grand scale of the race made it a true adventure. The race organizers did a good job putting this race together. When I first learned about this race, it seemed to me to be a logistical nightmare. In addition to organizing a start and a finish as in a traditional race, there were 35 “exchange zones,” or finish lines to the individual legs and staging areas for the teams who were starting the next legs. The various exchange zones were post offices, volunteer fire rescue stations, church parking lots, the Penland School of Crafts, and the odd gas station. BRR was an undulating course with lots of scenery. A sign in Barnardsville, NC warns a steep climb on the next leg. Since a lot of these were in very rural areas and were used in the middle of the night, there obviously was a lot of planning done before the race. In addition, there was a lot of local support from the communities through which we ran, including police support (most notably when a red Trans Am type vehicle zoomed through one of the late-night exchange zones and had to be chased down by a local police officer). Literally 100s of portable toilets were at the exchange zones throughout the race. The courses for the most part were well-marked, with signage at almost all of the turns. While there definitely was some nervous energy at the beginning, this race was informal from the get-go. Most of the passenger vans were decorated in some fashion or, like ours, at least had some race-related graffiti written on the windows. For example, before the 10:30 start of our wave of runners, one of the teams huddled its members together and loudly, publically proclaimed that it was time for “The Prayer.” I was not sure what to expect. The team then opened their passenger van to reveal a jacked up speaker system, and blasted the audio of the Prayer from Talladega Nights for everyone. 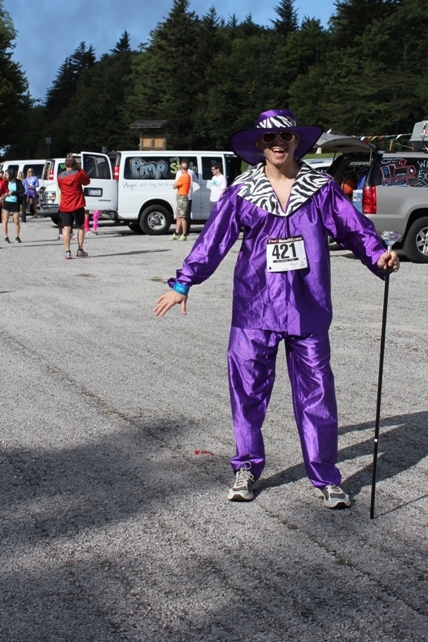 Some of the runners were dressed up in costumes for the intial leg of the race. As far as any nutrition, the teams were pretty much on their own. You had to bring all of your own water, food, etc. that your team would need. There were very few places during most of the race where you could re-supply; in addition, since the race is through the night, most of the few stores that were on the course were closed when we passed them. The finish line was at Battery Park in Asheville. While the location was good, there was no significant designated area for racers or their friends or family after the race. This may have been because the teams necessarily come into town in waves throughout the day. There was not as much “swag” as I expected for such a large race (actually, there was none); the finish line reward was a refrigerator magnet (not a medal, trophy, or anything to memorialize actually finishing the race); there was no congregating area or water or food at the finish. You just sort of went through the finishing chute, got your magnet, and were told you did a good job. The thought may be that finishing in Asheville, you have tons of eating and drinking options within a couple of blocks from the finish line. In any event, these are minor criticisms to what was an overall fantastic experience. After the race and after some rest, our team went out for refreshments at Asheville’s local watering hole, Barley’s Tap Room (while aging a little bit, it’s ambiance still equals that of the Barley’s in Knoxville, see my story about that one here). The winning team, the Asheville Running Collective, was there, too. One of their members came over and talked to us about the race. He had run the Hood to Coast relay previously, and he told us that BRR blows it away in terms of vertical climbing and overall difficulty. 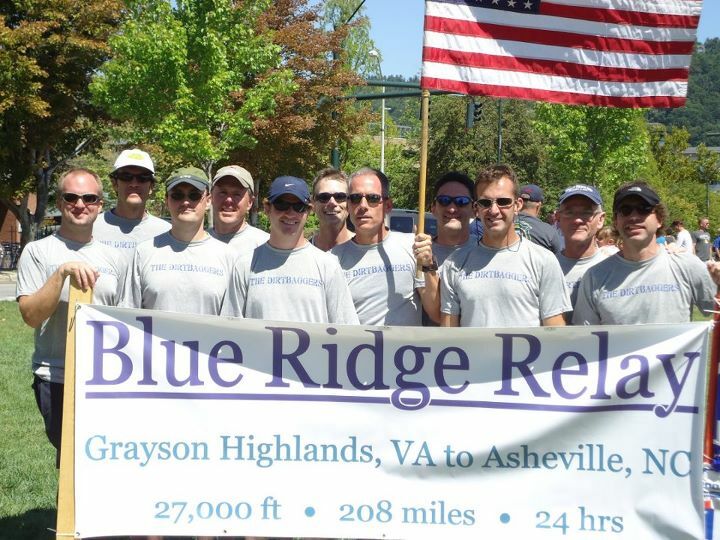 Finishing the Blue Ridge Relay was a tour de force for our team. If you have a group of 6 to 12 individuals who want to punish themselves and have fun doing so, this is a great race. Bring your A-game, though, and save some for the middle. Because at 3:30 AM, this race is a beast. 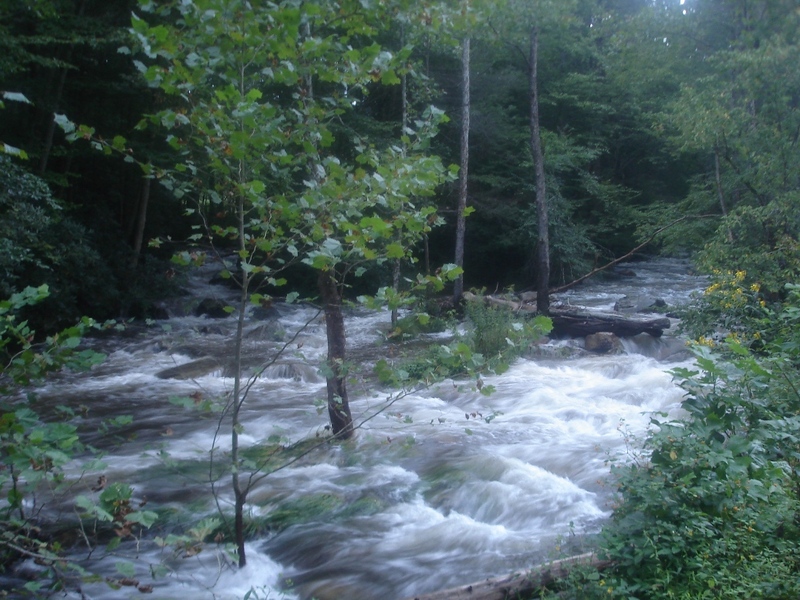 This photo taken with a point-and-click camera shows Brumley Creek the day after the heavy rains from Tropical Depression Lee last week. Normally, this creek is only about 10 feet wide during low water. As a point of reference in the photo, the distance from the bank on the right side to the large tree in foreground in the middle of the creek is about 15 feet (and the width of the stream from the tree to the other side is at least about another 10-15 feet). We went down to the creek in the evening to look around, and to see how high the water would have risen from the storm water runoff. Usually this section of the creek is quiet, but there was a roar from the water that you could hear as soon as you opened the car door. How do trout survive in such a rapidly changing environment? 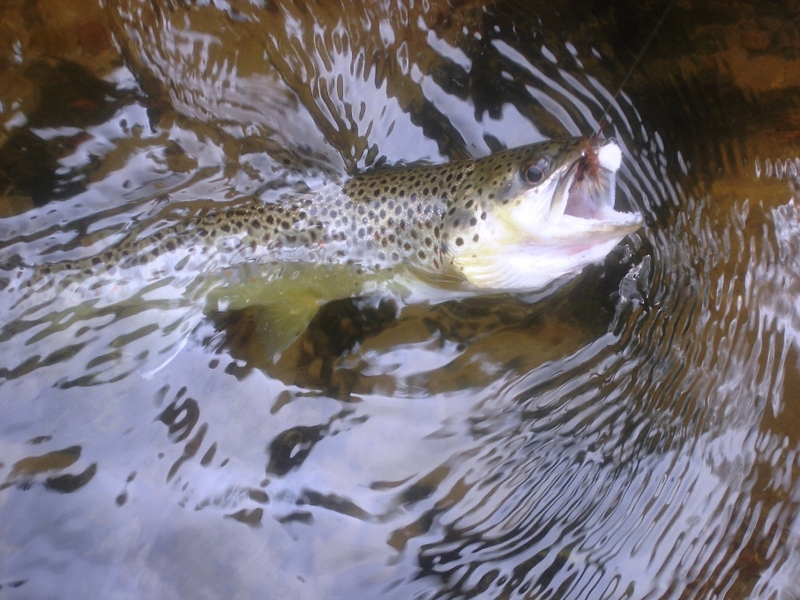 This week over at the Orvis Fly Fishing Blog Drew Price explains. Simplifying the explanation, the torrential flow we view from surface is moderated at the bottom, and there are places where the fish can hold and stay safe. 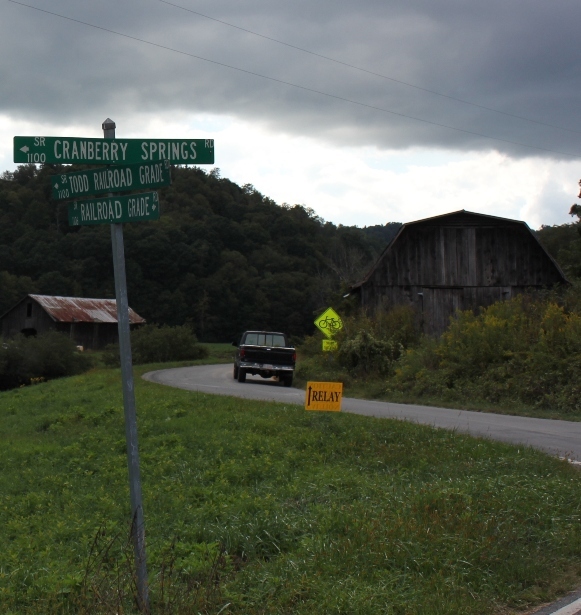 A little bit about Brumley Creek: Technically, it is the closest trout stream to Abingdon. It’s a small stocked creek less than 10 miles from town. It doesn’t have a reputation for producing large or many fish, as there are not many holdovers from the previous seasons. It’s also not regulated, i.e., it’s open to all fisherman who hold a trout license during the stocking season. As stated above, it’s also small. It’s still a pretty little creek though. Note that this description is of the stocked lower section of the creek, which has about 1/2 mile or so of fishable water, on Trout Road. The creek flows from Hidden Valley Wildlife Management Area and down off of Clinch Mountain. Driving south along I-81 in Wythe County, you cannot help but notice that there is one aesthetically appealing mountain on your left that notably rises from the valley floor much closer to the interstate than the surrounding mountains. This is Glade Mountain. The mountain becomes visible to the south of the interstate just past Rural Retreat (Exit 60). Glade Mountain parallels the interstate for almost 10 miles, receding only as you approach Atkins (Exit 50). Glade Mountain is part of the Mount Rogers National Recreation Area and lies entirely in the Jefferson National Forest. It is distinctive in that it is separated from the main part of the recreation area, yet is one of the largest mountains in terms of mass within the area. Despite its proximity to I-81, it is seldom visited other than by local Wythe and Smyth County residents and Appalachian Trail thru-hikers. 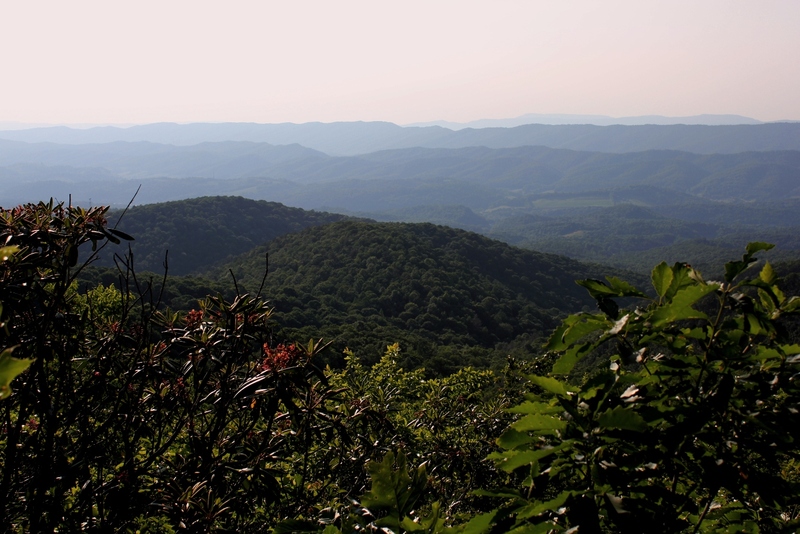 Thru-hikers get their first view of Virginia’s valley and ridge mountains when they cross the mountain. Glade Mountain affords views of Big Walker Mountain, Clinch Mountain, and even part of East River Mountain (the West Virginia state line) to the north. Most out-of-the-area hikers pass up Glade Mountain for other more written about and better known mountains further down the interstate. This leaves Glade Mountain to those of us who appreciate its solitude. I have hiked this mountain on several Saturday afternoons, and the only other hikers I have ever met on the mountain are a handful of thru-hikers in spring and early summer on their way north. I also once met a single thru-hiker on his way south in the fall. The AT crosses Glade Mountain on a north-south axis. The base of the trail leaves the Settlers Museum of Southwest Virginia in Groseclose, and after about ½ mile through the forest heads up the mountain in a due south direction. 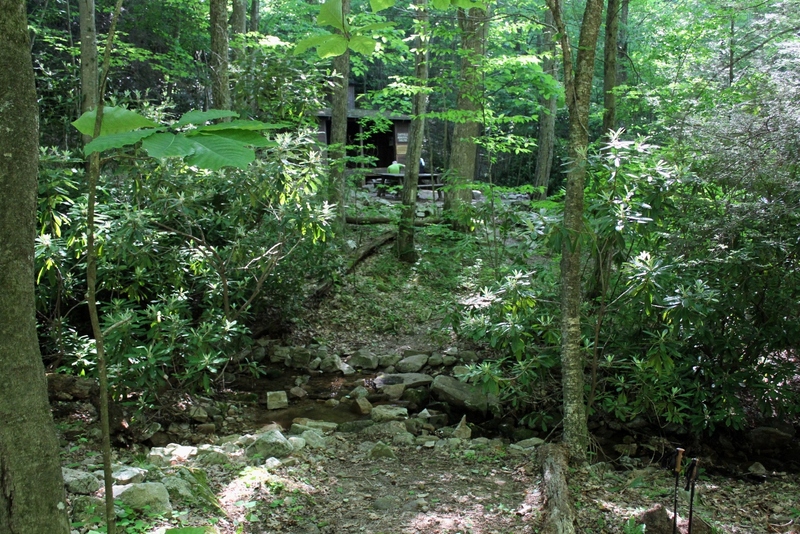 Once climbing the mountain, the trail parallels a very small creek (about 1-2 feet in width). 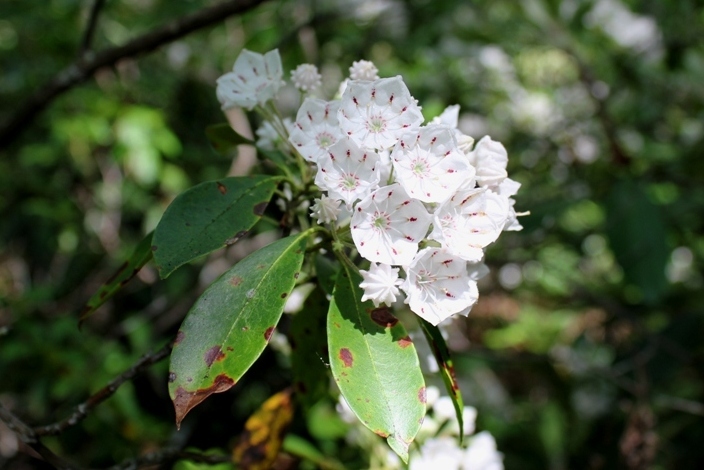 In June the mountain laurel on the north side of the mountain bloom profusely. 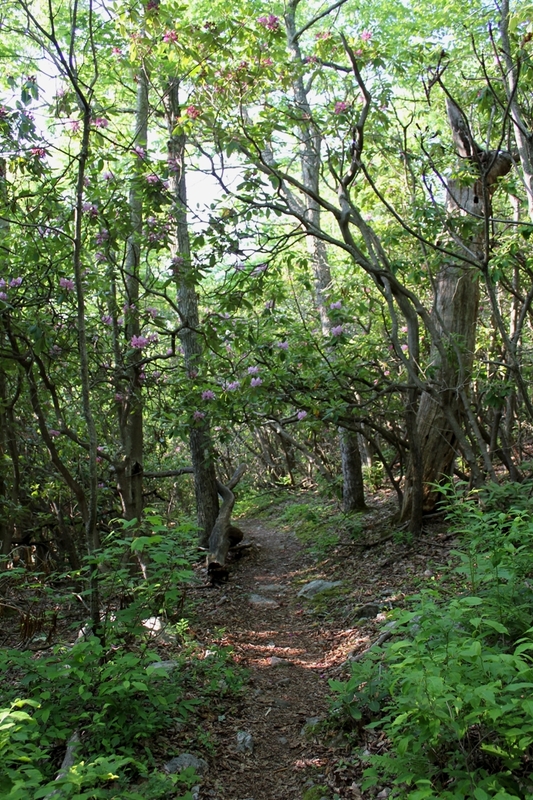 The northern section of the trail (the side closest to the Settlers Museum) has huge rhododendron thickets and mountain laurel thickets. 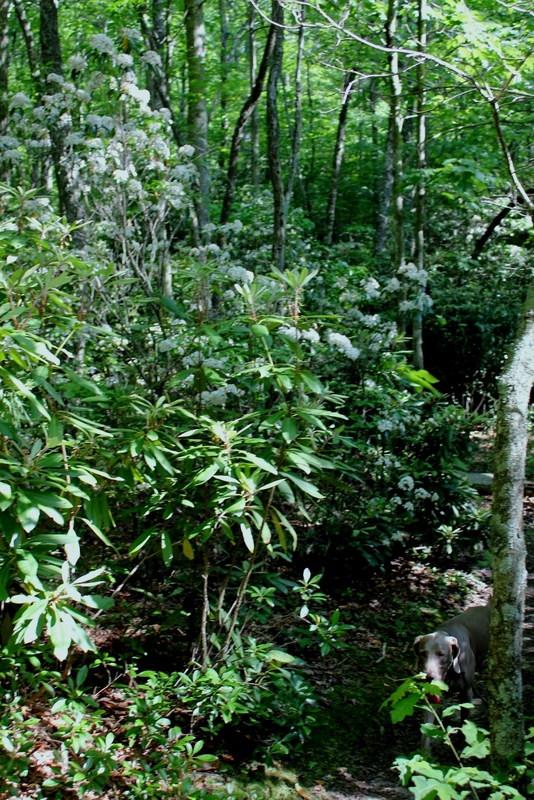 At some points you travel through a tunnel of rhododendron that barely allows room for a backpack. The trail travels uphill for about 3 or 4 miles, crossing Forest Road 86 (identified on some maps as Forest Road 644). The trail continues south and higher up the mountain to the Louise Chatfield Shelter, a fairly nice shelter on the mountainside close to a year-round creek. The trail then continues for another approximately 1 ½ to 2 miles to the top of the mountain. There are a few places on the trail where the trees open up enough for a brief view of the valley and to the north. The views are much better in winter, when the canopy does not obscure the view. 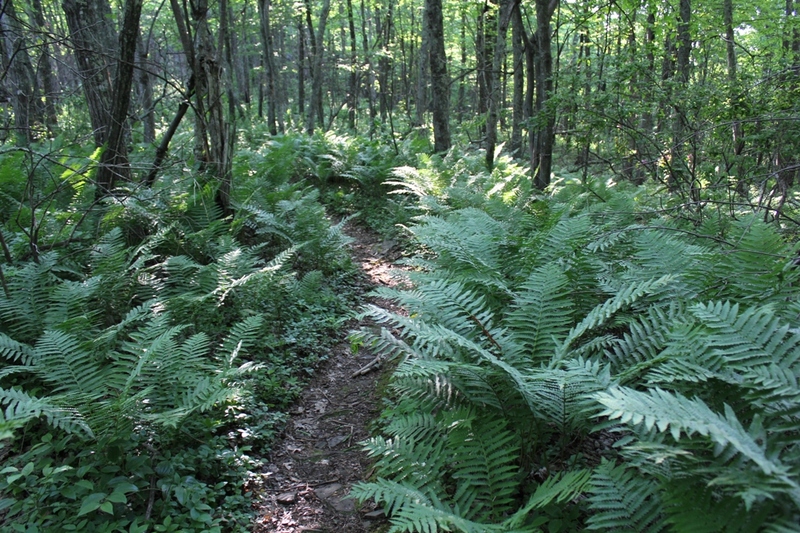 Towards the summit there are expanses of ferns over four feet in height under the trees. There is no designated spot or clearing that identifies the location of the summit. The trail then descends the south side of the mountain until it crosses Forest Road 86 again, eventually crossing Route 16 approximately 4 miles further. Forest Road 86 forms a band around the entire mountain about ½ way up from the base. Forest Road 86 is open to mountain bikes (and even off-road vehicles), and can be combined with the AT to form a large loop run (approximately 12 miles). 6. The Settlers Museum is on your left. Tropical Storm Lee has been slowly moving towards Southwest Virginia. Its precursor precipitation bands arrived Sunday afternoon, and it rained most of Sunday night. The Doppler radar weather map Monday morning looked like it was painted green, with just a small area around Washington County not showing rain. It was a small decent-weather window in which to labor through one last long run on the Virginia Creeper Trail before the Blue Ridge Relay race later this week. The long, lithesome body and outstretched tail of an auburn-colored red fox darting over the trail only 100 feet in front of me. All of this was on a four-mile stretch of the trail from the Abingdon trailhead. On this website, I usually don’t cover too much about the Virginia Creeper Trail, in part because it’s covered extensively on other sites, and on this site I seek to provide information about some of the less-known outdoor activities near Abingdon. That said, it is true that sometimes we take for granted that which is closest to us. The Virginia Creeper Trail is really something quite special; a solitary trip at an unusual time is sometimes the best way to reawaken awareness of how fortunate we are to have this awesome natural resource literally in our backyard. This 12″ brown trout was caught (and released) today in Wythe County on a Royal Parachute Madam X, aka PMX, a dry fly that is a terrestrial pattern similar to a Royal Wulff with a caddis-type hackle and rubber legs. It looks a little bit like a lot of different types of insects and is an attractor fly as well. The brown trout hit the dry fly pretty hard, which was a nice ending to an otherwise quiet day on the water that seemed to be mostly about casting practice. But with temperatures reaching 96 degrees in the region, wet-wading and fishing a cool mountain stream was a nice start to the Labor Day weekend.